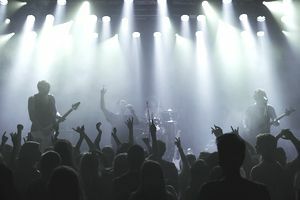 Playing live may be the most important thing a band can do, but booking a gig can seem like an overwhelming process — especially when a band is making all of the booking themselves. If your band is unsigned, playing live is a great way to build up a loyal fan base, get some media attention and attract record label interest. For signed bands, gigs are the best way to build your audience while promoting your new releases. If you're in a cold sweat about how to book shows for your band, take a deep breath, relax and follow these steps and you will surely get your band on stage. Let's start at the beginning. Before you even can think about booking a gig, there are a few things you will need to have in place. A , including information about your band and clippings of any press coverage you may have had. You should also have an idea of when you want to play a show — approaching a venue or promoter and asking for a gig "whenever" doesn't send a message that you are a professional band looking for consistent work. Come up with a window of preferred dates, make sure everyone in the band has their calendar clear for those days and present your availability to the venue or promoter. Sometimes, venues work with a specific promoter, and sometimes they don't. Give your venue of choice a call to find out how they do things. If you don't know any promoters, ask the venue for advice, or ask around to find out with whom other bands in your area work. If possible, get the names of a few different promoters and venue booking agents and send them all promo packages — nothing wrong with people fighting to give you a chance to play, right? Tired of booking gigs for yourself? Try getting a or on board who can help you get the shows you want. A good deal is part of a good gig. You should prepare yourself, however, for the fact that many shows lose money. If you're just getting started and don't have much of a following yet, you should think of your gigs as promotional opportunities for your band rather than moneymaking opportunities. Your willingness to work with a promoter and/or venue to try and minimize the financial risk involved in a show will only help convince people to work with you. Your deal should detail how any income for the show will be divided and confirm information about things like accommodation for the band, riders, backline, and soundchecks. If there is something you're unsure about or you don't think is fair, speak up well in advance of the show. Now all you have to do is show up and play a good show. Be professional, treat the promoter and the people at the venue with respect, and if you can't handle yourself well if you drink all of the riders before going on stage, then don't overdo it. If you happen to have an off night, but you have treated people well, most promoters will want to work with you again. If you've given everyone working to put on the show a night of utter chaos and stress, well, you probably will not get a call back anytime soon. Make sure you take full advantage of the audience at the show and promote any releases, new websites, or any other news the band may have. Encourage everyone who enjoyed your set to sign up for your mailing list, so you can let them know when you're playing again.